Question: Your philosophy states that "The likely location of the test communities will be from the states where WellPoint has markets". We are a community of about 10,000 that has an interest, but as I understand it, Wellpoint does not have a market here. Should we consider our community to be excluded from consideration for this effort? Quite the contrary, we are hopeful to inspire an entire network of communities just like yours to actively participate in the Healthcare X PRIZE. While the actual Prize competition has some operational limitations, including constraining the competing population to WellPoint employer "communities", we are contemplating designing a demonstration division wherein real, physical communities such as yours can compete within the X PRIZE framework. This may require some additional sponsorship money and heavy lifting in terms of community data sharing, but we believe this could be lead to some great breakthroughs for communities who would most benefit from this type of innovation. A question I would have you consider, just as I asked Oroville, Ohio to do, is how would you organize your community to be able to share claims information, health data from individuals, and the general data management that we would need in order to operate the prize. Would a new entity need to be created? Who would head this entity? How would the entity be funded? These questions begin to give a flavor of the very real, but not insurmountable challenges, and the requirements for widespread community support from multiple stakeholders to pull it off. However, maybe this is absolutely what is required and necessarily to lead to the break through health innovations we are seeking. For this reason, we are seriously contemplating a "demonstration division", where in true communities can compete along side of the employer based groups. They would have the same rules, the same measurement set, and the same reporting requirements available. We could potentially obtain additional sponsorship money to fund a purse for this and hope to incent alot of community based innovation in the process. This feels like it has a life of its own . . . we will keep exploring this. Your comments and criticisms of a "demonstration division"? An interim update on the progress of the Healthcare X PRIZEas it moves through the Prize Design Process in anticipation of several key milestones in July. The X PRIZE Foundation is the world wide leader in developing and operating incentivized competitions designed to transform entire industries. This model has been highly successful in technological break through's (like the Ansari X PRIZE and the Progressive Automotive X PRIZE) and in helping the unimaginable become commonplace (like the Google Lunar X PRIZE). As X PRIZE has surveyed the world-wide market for innovation, it is becoming clear that the many world wide systemic failures (education, health, poverty, etc) can and should be addressed with incentivized competitions. The first attempt at this is with the development of the Healthcare X PRIZE. WellPoint has stepped forward to sponsor both the Prize Development process as well as the winners purse. However, a systems prize is a challenge for a variety of reasons. Its bigger, its more complicated, it has far more moving parts, and given its complext interactions it is alot harder to describe in a single sentence statement. However, Healthcare is big, complicated, has lots of moving parts, and multiple interactions from lots of different players. What the Healthcare X PRIZE Design Team is trying to do is to simplify the madness and refocus on those things that can truly make a difference within the constraints and challenges of our competition framework. 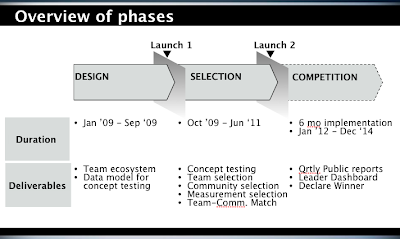 The phases and timelines are all approximations subject to revision as part of the normal Prize Development process. First, we have the Design phase which we are currently in. During this phase we are attempting to develop the infrastructure for Prize operations, the rules and measurement set, and to define the competition in such a way that teams will want to compete, that our sponsor will want to fund the prize, and that we can make the impact that we aspire to (nothing short of transforming the health care system of course!). The next step, which is anticipated to begin following the Prize Launch event this fall, is the Selection phase. During this phase we plan to actively recruit communities and potential teams interested in participating in the competition. The EcoSystem is also anticipated to launch during this time, and will be a large collaboratory of teams, communities, individuals, point solutions, and other vendors who are interested in the HXP. We are hopeful that it serves as a useful match making service, an online marketplace for health care innovators to share ideas, meet each other, and engage in collaborative projects that advance the ball for everyone. We have begun to explore potential partnerships in this area, and several innovative technologies exist that can create this type of environment which we hope will live on well beyond the lifetime of the competition (more later). Teams will be registering, putting forward their concept, modeling that concept against a standardized database made available by WellPoint, and then having to validate their assumptions based on feedback from the independent judging panel who will have strict evaluation criteria but allow for the freedom for the widest range of solutions. Once teams pass the "threshold of validity", they will be available for the "match" with the five test communities. "Communities" (most likely geographically based employer communities for reasons to be discussed) will also be selected from across the 14 states in which WellPoint operates. Community criteria are being finalized but will fall along the line of history of innovation, willingness to share information, geographic concentration of employees, data management capabilities, culture, leadership, and a variety of other factors. The five communities will rigorously studied, evaluated, and every attempt will be made to select "actuarially equivalent" populations. Communities will ultimately be "matched" to five Teams in an analogous process to the residency match (details forthcoming). The measurement set, which we will begin to share publicly over the coming months, will also be finalized and validated during this selection period. We anticipate what we will put forward represents one thoughtful approach (among many alternatives) to help orient the teams to continue to move along the health value chain from disease -> health -> vitality. These will be subject to further refinement and validation during this phase by our team of measurement advisors and experts. Given the amount of activities you can see why we are currently allowing for 18 months for this phase to complete. After the team and community match, we have allocated a 6 month window for team / solution implementation. Finally, after implementation is complete, the Competition phase can begin as planned in January 2012. During the competition phase Teams and Communities will be workign together to introduce health finance, care delivery, and personal incentive innovations that improve the Community Health Index while lowering the Total Cost required to obtain those results. Teams will be required to file quarterly reports which will be made publicly available to all interested parties and biannual educational conference events will be held with most sessions being made available to the public. A publicly available leader board will document who is leading the competition at all times and a public site will make available preliminary results from the competition. Independent third party judges, who audit the quarterly reports, will pronounce a winner at the end of the three year competition cycle. While none of the above is set in stone, it should provide a summary of current thinking and is shared in this raw form to maintain our commitment to a transparent development process. We realize, occasionally to our own frustration, that we raise just as many questions as answer in moving through our Prize Development process. What I can say, without reservation, is that we are really trying to remain true to our aspirations of tranforming the health care system through the magically medium of the X PRIZE. We have received some great feedback from many people throughout the world regarding our development of the Healthcare X PRIZE. It has been a fascinating project and we are working toward launching the prize this fall. One commenter had a concern about how the prize could create a level playing field given the wide variation in costs and quality throughout the country. Our colleagues at Dartmouth Health Policy Center have done a phenomenal job over the last 20 years documenting and explaining the reasons for these variations in care. Atule Gawande's article was an explosive reminder that we have a LONG way to go in moving toward a next generation health system that can delivery health care value. Notice I did not say high quality, didn't mention cost, nor did I define any condition specific outcome that I hope a next generation health system can deliver. The entire framework of the Healthcare X PRIZE is based on the actual "value" delivered by the overall system as it interacts with you, not an anyone or several individual parts. The notion of value (outcomes / costs) is the great equalizer that levels the playing field throughout the country. McAllen Texas might be twice the cost as everyone else in the United States, and if they were delivering 2-5X the results, no one would complain. However, as Dartmouth has shown, the more you spend the worse your outcomes actually are. McAllen just happens to be the current poster child of high intensity, low value health care. Believe me, there are plenty of others. 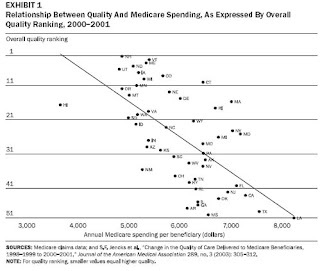 Graphic Depicting variations in quality and spending between states for Medicare beneficiaries. Hawaii scores well - high quality at a low cost (Credit, Elliot Fisher, 2006). Conversely, there are other systems that spend very little, yet produce excellent outcomes. In fact, Hawaii spends the least of anyone and has fairly high quality scores. In other words, they produce great value. The focus on health care value is the great equalizer as I mentioned before because I venture to say that spending 8% of GDP on health (like some countries) might not be enough. Spending 16% like we do might not be enough either. But what we can say, is that 8 or 16% right now does not buy us very much. Not very much at all. Hence, the Healthcare X PRIZE focus on value and focus on redesigning health finance, care delivery, and personal incentives to help create a next generation health system that delivers high value. Please stay tuned for prize design information we will be releasing in the coming days and weeks leading up to the formal Prize launch this fall. Effective health-care reform must meet two objectives: 1) It must secure coverage for all Americans, and 2) it must dramatically lower the cost of health care. Health-care spending has outpaced the rise in all other consumer spending by nearly a factor of three since 1980, increasing to 18% of GDP in 2009 from 9% of GDP. This disturbing trend will not change regardless of who pays these costs -- government or the private sector -- unless we can find a way to improve the health of our citizens. Failure to do so will make American companies less competitive in the global marketplace, increase taxes, and undermine our economy. At Safeway we believe that well-designed health-care reform, utilizing market-based solutions, can ultimately reduce our nation's health-care bill by 40%. The key to achieving these savings is health-care plans that reward healthy behavior. As a self-insured employer, Safeway designed just such a plan in 2005 and has made continuous improvements each year. The results have been remarkable. During this four-year period, we have kept our per capita health-care costs flat (that includes both the employee and the employer portion), while most American companies' costs have increased 38% over the same four years. Safeway's plan capitalizes on two key insights gained in 2005. The first is that 70% of all health-care costs are the direct result of behavior. The second insight, which is well understood by the providers of health care, is that 74% of all costs are confined to four chronic conditions (cardiovascular disease, cancer, diabetes and obesity). Furthermore, 80% of cardiovascular disease and diabetes is preventable, 60% of cancers are preventable, and more than 90% of obesity is preventable. As much as we would like to take credit for being a health-care innovator, Safeway has done nothing more than borrow from the well-tested automobile insurance model. For decades, driving behavior has been correlated with accident risk and has therefore translated into premium differences among drivers. Stated somewhat differently, the auto-insurance industry has long recognized the role of personal responsibility. As a result, bad behaviors (like speeding, tickets for failure to follow the rules of the road, and frequency of accidents) are considered when establishing insurance premiums. Bad driver premiums are not subsidized by the good driver premiums. As with most employers, Safeway's employees pay a portion of their own health care through premiums, co-pays and deductibles. The big difference between Safeway and most employers is that we have pronounced differences in premiums that reflect each covered member's behaviors. Our plan utilizes a provision in the 1996 Health Insurance Portability and Accountability Act that permits employers to differentiate premiums based on behaviors. Currently we are focused on tobacco usage, healthy weight, blood pressure and cholesterol levels. Safeway's Healthy Measures program is completely voluntary and currently covers 74% of the insured nonunion work force. Employees are tested for the four measures cited above and receive premium discounts off a "base level" premium for each test they pass. Data is collected by outside parties and not shared with company management. If they pass all four tests, annual premiums are reduced $780 for individuals and $1,560 for families. Should they fail any or all tests, they can be tested again in 12 months. If they pass or have made appropriate progress on something like obesity, the company provides a refund equal to the premium differences established at the beginning of the plan year. At Safeway, we are building a culture of health and fitness. The numbers speak for themselves. Our obesity and smoking rates are roughly 70% of the national average and our health-care costs for four years have been held constant. When surveyed, 78% of our employees rated our plan good, very good or excellent. In addition, 76% asked for more financial incentives to reward healthy behaviors. We have heard from dozens of employees who lost weight, lowered their blood-pressure and cholesterol levels, and are enjoying better health because of this program. Many discovered for the first time that they have high blood pressure, and others have been told by their doctor that they have added years to their life. Today, we are constrained by current laws from increasing these incentives. We reward plan members $312 per year for not using tobacco, yet the annual cost of insuring a tobacco user is $1,400. Reform legislation needs to raise the federal legal limits so that incentives can better match the true incremental benefit of not engaging in these unhealthy behaviors. If these limits are appropriately increased, I am confident Safeway's per capita health-care costs will decline for at least another five years as our work force becomes healthier. The Healthy Measures program currently applies only to our nonunion work force. While we have numerous health and wellness provisions in our union contracts, we are working with union leaders like Joe Hansen of the United Food and Commercial Workers to incorporate healthy measures provisions in our union work force as well. While comprehensive health-care reform needs to address a number of other key issues, we believe that personal responsibility and financial incentives are the path to a healthier America. By our calculation, if the nation had adopted our approach in 2005, the nation's direct health-care bill would be $550 billion less than it is today. This is almost four times the $150 billion that most experts estimate to be the cost of covering today's 47 million uninsured. The implication is that we can achieve health-care reform with universal coverage and declining per capita health-care costs. There is a very real possibility that we will see positive transformational health-care reform in the near future. I am encouraged by the effort I see on Capitol Hill, particularly the bipartisan effort in the Senate. While some tough issues remain, if we continue to work in a bipartisan manner I believe we will resolve these issues successfully and find agreement on meaningful reform. Mr. Burd is CEO of Safeway Inc., and the founder of the Coalition to Advance Healthcare Reform. We have discussed in brief the opportunity to work with true geographic communities versus other types of communities (including employer based). One of the more interesting groups is from Orrville, Ohio and we received permission from their team leader to share some information on their initiative. Frustrated by the prevalence of chronic disease and the concern that our children would suffer form the same ailments, we decided as a community that a change was needed in healthcare and we felt that that change would best be done at the community level. In 2003, a community coalition, Growing Healthy Habits (GHH) was formed to impact the health of our children. Obesity prevention has been and continues to be a focal point of the GHH initiative. Educating parents as to why childhood obesity must be addressed remains an important objective of the GHH initiative. Meanwhile, healthcare costs continued to rise. A second initiative, the Healthcare Cost Reduction Coalition of Orrville (HCRC), was formed in 2007 in an effort to address the rising cost of employer and employee healthcare. Consortium members include physician groups, employers, the chamber of commerce president, and hospital and City of Orrville representatives. The goal of the HCRC is to integrate incentivized employee wellness programs into the price structure of employer-provided insurance benefits. Data from the wellness programs will be compiled and tracked in a community database or health information exchange and made available to the residents and industrial leaders. Orrville, a community of 8,500 residents, is home to a critical access hospital, two family practice groups, a number of manufacturers, two grocery stores, four pharmacies, a city school system, and various restaurants and small businesses. In short, Orrville is a microcosm of society contained within a four-mile radius. Orrville has been recognized as a healthy community by the Ohio Department of Health for the past three years. The recent announcement of the X Prize Foundation regarding its healthcare initiative gives creditability to our efforts at local healthcare reform while acting as a catalyst for further collaborations. Our goal is to make Orrville the healthiest city and wellness culture in Ohio We look forward to competing in the Healthcare X Prize to prove it! Part I of a series of answers to questions that have been submitted to the Healthcare X PRIZE team for consideration. We wanted to share with you some of the early thinking as it relates to these questions. 1. Our team would like to emphasize a community / public health /population paradigm. How can we take this approach if the target population is not a traditional community defined by geography? Our target population will be contained within a defined geographic area (first four digits of Zip Code). We believe the best aggregator of participants will be employers rather than a traditional community. Employers represent the channel by which 60+% of health care value is purchased and a natural delivery mechanism for information and programs. They also have access to specific information that will be required for prize operations. Conversely, a traditional community is obviously attractive because we believe improving population health should be the designed outcome for any health system. There are advantages and disadvantages to both types of aggregators. From a competition and operational perspective, we are currently anticipating working through employers. 2. Can a team suggest a target population local to its area? (And some teams will not be located in a WellPoint market area). Given that there will be considerable team / provider interaction, local knowledge, relations and physical access will be a major advantage. Therefore, either all teams should have the option of choosing local populations, or no team should be able to do this. We agree with this perspective. Many potential teams are able to deliver exceptional health value due to the inherent organizational, contractual, and cultural advantages that have been established. While these groups represent market leaders, the aim of the HXP is to see if these advantags can be replicated in new markets. As a result, we are designing the competition such that teams will have to compete outside of their “home court” to remove any unfair advantages. As a result of this and the geographic constraints, we are still considering creating a demonstration division where teams can “compete alongside” the competition (follow same rules, competition guidelines, reporting requirements, etc) but not be a part of the official competition. 3) To what extent can we address social factors and social determinants? Can we collaborate with social services or community organizations more broadly? If so, then the advantage may go to teams in a clearly delimited geographic area (say, as compared to an employer-linked population group dispersed across a very large metro area). Teams are strongly encouraged to take a “community based approach” as we believe health needs to involve and engage the community, including the social services and community organizations that can and should contribute to improvements in community health. We will take geographic dispersement under consideration when selecting “communities” and attempt to control for this variable in the selection process. 4) Ideally any US health care solution should address the problems of the uninsured, underinsured or lower socio-economic groups likely to be on Medicaid. Might it be possible to include some of these cohorts proportionately in the target population? Given the pre-eminent focus on access by others, we have chosen to focus on other aspects of the health care reform debate. We are currently working with our sponsor WellPoint, as well as with state Medicaid programs to include disadvantaged groups like you mention. We believe this will also improve the impact and relevance of our efforts to include those most in need. We also like the notion of specific cohorts that each team will have to manage, and are considering how this can potentially be operationalized. 5) A target population of 10K is far too small for at least two reasons: there will be limited efficiencies of scale; and the likelihood of meaningful impact on enrollees due to the epidemiology of disease over a three year period. We would recommend target populations of at least 35K. We are currently investigating the number of outcomes (events) that happen in representative populations of different sizes. We are currently working with WellPoint's analytic division, HealthCore, to determine the correct population size. The size of the population must be balanced against operational constraints of prize administration. We agree with you that a larger number would be better, but believe that a population of 10K is a reasonable compromise. Do you have any evidence of significant epidemiological differences between a population of 35K vs. 10K that would justify the additional cost, complexity, and challenge of operating a larger test population. 6) The issue of enrollee turnover will be a challenge. If we expect a typical 20% per annum turnover among the insured population, then only about 50% of the population will be present after three years. It might be appropriate to stratify impact by length of enrollment or limit final population to continuous enrollees, but that would required a much larger starting number. We are going to be contracting with the “communities” (employers) for a three year period. We are considering stability of community when selecting the communities but have not finalized our methodology for how to best handle attrition (perhaps use person years?). We are also evaluating how we can use COBRA and retiree programs to extend participation from turnover. Modeling the 20% attrition you assume, would require the base population to be approximately 15,000 people (~50% of the population would turnover over three years). We will take this under consideration. 7) Communication with providers will be key. If providers have a very small % of their enrollees involved in the competition, how will we get their attention? The only way this would work is a small geographic area where most of their patients are insured by Blue Cross (WellPoint) but such communities are not fully representative of the US and are not scalable. We are asking for prospective communities to highlight HXP participation support from local providers as part of their application process. We don’t expect that teams will work with all local providers, but rather will offer incentives and additional support to those who seem most receptive to their programs. We believe that participation of individuals in the test program can be accomplished through support of “activated providers” who will offer new programs (eg, home/office visits, telephonic, transition management programs, care coordination, etc). Of necessity, this “recruitment” will most likely be successful with traditional early adopters who will benefit from a virtuous cycle of recognition, innovation, and media attention. We realize this will be challenging and we will not win over every provider at once but we believe we will find enough providers willing to participate to have a viable competition. 8) Provider EHR/HIT and consumer PHRs/ web portals will be key to any group’s response. To what degree will the communities that are targeted already be wired? If not, this will be a major undertaking and the extent to which this HIT development is necessary must be comparable across teams to ensure a level playing field. Also, given the “HITECH” subsidies being rolled out soon perhaps these resources can be coordinated so as not to count towards the cost-of-care input costs. We would recommend close cooperation with the Office of the National Coordinator for HIT. We share your opinion about the value of EHR/PHR in potentially contributing to delivering, managing, and improving health interventions. However, given that <10% of hospitals and <35% of providers have EHR/PHR we are unclear of any evidence that these IT tools will be necessary to achieve. Furthermore, much of the data that will be shared as part of this competition is not currently included in current EHR/PHR offerings (Claims data, other feeds from insurer/employer, self reported surveys, etc). We will consider adding “degree of connectedness” as one of the community criteria to attempt to avoid selection bias. We anticipate that many teams will have to add several new capabilities to their communities they are managing. 9) We assume that the price of health care varies across target populations; this will be adjusted for. This involves not only provider price but also practice “signature”. That is, if current practices patterns vary considerably (e.g., the MN / FL issue) that must be taken into consideration for comparability’s sake. Moreover, it actually may be an unfair advantage for a team to be assigned a FL type of “intense use” practice environment as it will be much easier to obtain savings in such an area given the likely “fat” in the system. This variability will be handled by both a selection process that will account for variations in spending as well as a matched control in an adjacent 4 digit zip code area. Our measurement infrastructure will measure relative delta’s not absolutes. While we will attempt to control this through selection/matching, we might not be able to control all aspects of practice signature. However, we are expecting that the ability to influence both outcomes and costs can help to equalize this (FL might need to focus more on cost related issues but since MN has already solved this to some degree they focus more heavily on quality related issues). We are open to suggestions on how to optimize this. 10) Will we need to supply a complete care-management/DM infrastructure? Or, can we (or must we) use Wellpoint’s current care management providers? We are considering whether WellPoint can actually be a vendor to the competition. This requires clearance from ethics/legal teams. WellPoint will clearly not be able to be an exclusive member of any one team, nor do we expect that any team will have to use their solutions. 11) The provider mix may be very different in across the locales (e.g., primary care / specialists mix, presence of groups/IDS's). Also the general adequacy of supply may vary across areas. Each provider situation will offer different challenges and will have a very significant impact on outcomes. This will need to be controlled for. We are aware of this situation (variability of provider mix). Teams will have to adjust for local provider mix. This is another trade off of a real world competition and the reality in which any competitor would find themselves. The Dartmouth team has some tools to evaluate provider mix that we are hopeful to deploy to help adjust for this in the community selection process. 12) The issue of intellectual property (IP) needs to be clarified. To what extent will concepts methods and tools remain the property of team or must be put in the public domain? Also will WellPoint have access to any “left behind” IP for their own commercial use without paying future ongoing licensing fees to the team? This issue will be clarified in the Master Teaming Agreement (MTA). The intention of WellPoint will be to make publicly available any IP they garner from the competition. Also, each team will maintain exclusive rights to the intellectual property they develop as part of the competition. Teams will be required to publish their results as part of the evaluation process. Public reporting of standardized outcomes information and methodologic overview will be included in this but we will make every effort to ensure that individual IP is protected as part of the competition. A stated objective of the Prize is to create an entirely new industry and we want teams to be able to mature into viable business entities. As such, we understand and respect the need to protect IP. 13) There is some discussion of a comparison group in the initial plan design. Will there be one selected for each target or only one overall? This is a good idea and you will need advice from research design methodologists. Please elaborate more fully in the next iteration of contest documentation. We will be providing a comparison or control group for each target area to account for some of the regional / payer variability that we discussed above. We will be utilizing a third party entity (Milliman, HealthCore, etc) to help us with this process. 14) The simulation approach you will use to select finalists is not entirely clear. In order for all teams to provide enough information to allow you to do this “bench test,” we will need considerably more clarity on the framework and content you will require as part of our preliminary plan response. We are currently working on this concept. Essentially, teams will have access to a WellPoint database from which teams must identify their population, assign them interventions, make projections of estimated impact, and provide a credible financial model of impact. Teams will also need to highlight how they will be able to achieve the 50% health value improvement. Teams who advance will be subject to further evaluation wherein they will have to justify their assumptions in order to qualify to be drafted by a community. 15) When the intervention is “turned on”, the referees must be meticulous about accounting for all costs that “deep pocketed” teams could absorb on their own. Also, you may need to control for potential geographic variation in a team’s costs (such as more travel by a distant team) to ensure a level playing field regarding input costs. Each team will be required to bill all operational services to the community. Back end development/internal costs not deployed to participants are not restricted. Costs will be audited by an independent auditor. Deep pocketed teams may have some advantage in development resources, but they will be competing against the agile development processes of smaller companies. We anticipate an exciting ecosystem evolving that will allow unique solutions to be developed or evolve quickly. We hope this seeds a very dynamic marketplace / industry going forward. 16) We understand that the competition needs a beginning and an end. However most of the seeds of the intervention will bear fruits well beyond the 3 year period. Is it possible to continue monitoring after three years and to estimate impact beyond 3 years? We believe that successful competitors will remain integrated into the test communities long after the competition. We hope that, with an appropriate measurement framework and auditing function in place, that teams/communities will continue to operate the intervention and continue to prove successful outcomes. Goal is to create independent business entities. Teams/Communities will need to determine how to sustain their business relationship beyond the competition time frame. 17) Do you want further input on suggest outcome metrics as part of plan? This would suggest iterations of the end-points so that all teams can be on the same page. We welcome public comment and feedback on the outcome metrics. We are working closely with Dartmouth, Brookings, IHI, Milliman, and others to ensure that appropriate metrics are evaluated and incorporated into the competition. We are attempting to keep the public involved in the iterative process by reporting back our findings. The Healthcare X PRIZE will be introducing an new health value measurement framework that will help focus on health care outcomes at a community level. The Healthcare X PRIZE (HXP) is being designed to create a next generation health system that increases efficiency, reduces costs, and improves health value. In order to drive this transformation, there needs to be a new way to measure, monitor, and improve the health care outcomes across the different interventions in local health delivery systems. There are currently a wide variety of measures and metrics used to evaluate health care, but these measures have not been utilized in a way that drives the delivery system to optimize for health care value at a both population and individual levels. As part of the breakthrough aspirations of the HXP, we intend to create new measures and metrics that focus on comparing different systems of health care delivery and financing and how they impact Health Care Value (HCV). Measuring the value produced by a health care system remains a difficult challenge which to date has prevented the meaningful comparison between different systems of care. We believe emphasizing health care value is the appropriate point of focus to leverage market competition in allocating resources efficiently and effectively. Furthermore, focusing on HCV [outcomes /cost] provides a useful framework to direct attention to removing disparities by maximizing improvements at a population health level. We believe the creation of a Community Health Index (CHI), which would combine broadly accepted and actionable population health measures (each with varying weights based on relative impact) would achieve this objective. It is currently unclear how many measures are required to give us the degree of confidence that we are accurately measuring impact, and we anticipate this will be a vigorous point of discussion among the HXP measurement subcommittee members. We also want to incorporate outcome measures that focus on either desirable health states (independent living status) or elimination of undesirable health events (hospitalization). In addition, where possible, the given metrics should be already available or relatively easy to obtain (to keep audit and tracking costs to a minimum). improving individual “vitality” would yield dramatic changes in reimbursement methods, prevention focus, and behavorial changes. The IVS will serve as a catalyst to transform our current current perspective of heath (“absence of disease”) to the invigorating and progressive concept of vitality. We believe that creating the IVS can revolutionize the way individuals, providers, and health systems think about managing a “health portfolio” (think health streaming), including the creation of individual health action plans that optimize health assets over time. Developing these three metrics - HCV, CHI, and IVS - will require careful thought, analytical integrity, and skillful compromise. We believe that the creation of the IVS will encourage teams to develop meaningful innovation in promoting vitality. Measuring HCV and creating a CHI will require detailed analysis, particularly given the role each will play in judging the HXP competition. Given that the CHI is a component of the overall HCV measure, it is logical to begin our measurement conversations around the creation and validation of a new CHI. We have begun to evaluate traditional measures of community health, including a) functional health pass rate (e.g., fitness test, % ambulatory, % living independently), b) ER visits, c) hospitalizations/ 30 day re-hospitalizations, d) Major morbidity/ disability, e) sick days taken, f) perceived health score, and g) patient experience and will be validating these ideas in an upcoming meeting with our Measurement Subcommittee in New York City on June 9-10. We are actively seeking input and guidance from our HXP measurement subcommittee and others in the development of these three measure. We look forward to your feedback. * Much of the CHI concept was based on excellent work by the Dartmouth Health Policy and Clinical Research Team.